Utilize more of your budget by reducing travel, per diem, overtime, and shift coverage costs without compromising quality. Our low annual fee gives each of your officers full access to all courses. 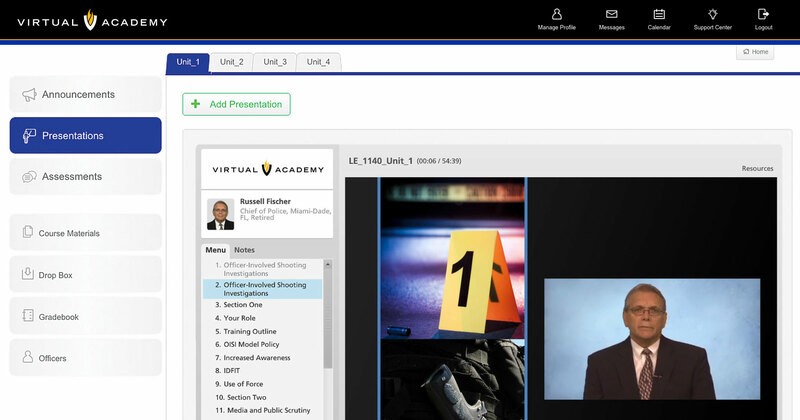 Virtual Academy’s elegantly simple solution provides your department the tools to schedule, deliver, and track training more efficiently than ever before. Now, you can deliver high quality, relevant training your officers need…anytime, anywhere – 100% online. Over 200 hours of top quality, expert-led training courses on demand. We work with leading experts to develop world-class training programs that reflect current needs in the constantly changing environment. With Virtual Academy, you can bring the best subject matter expertise in the country to your officers who otherwise wouldn’t have the opportunity to gain access to such high quality materials and resources. Plus, courses can be taken anytime, anywhere – so scheduling and travel costs are never an issue.